The Fantastic Four reboot did not live up to what it could have been. To put it mildly it sucked. The problems started before they even starting filming. Arguments between director, producers, and the studio was common place. During the filming the director Josh Trank allegedly caused over $100,000 of damage to a house he was renting during filming. The home owner made a complaint with the sheriff’s office and has filed a civil suit against Josh Trank. We do not know how this damage was caused but it sounds like Trank went off the deep end and had a meltdown. 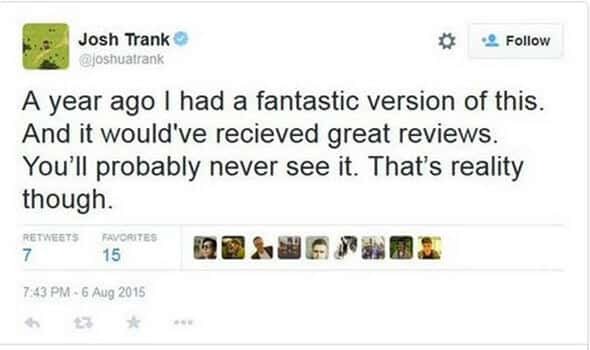 That was a tweet from Trank which he deleted fairly fast. It seems like Trank could have handled things better including that alleged $100,000 in damage but the studio really seemed to tie his hands. The studio fully handled casting and did not let Trank participate in that either which also ended up with more script rewrites. The trailer did not seem that bad but you may be better off watching the 1995 version of this movie which was never released. Fantastic Four was so bad that time Marvel paid the studio off to not release the film.